Co-op Childcare has become the first large childcare provider to achieve Millie’s Mark across all 44 of its nurseries, showcasing its nationwide commitment to child safety. 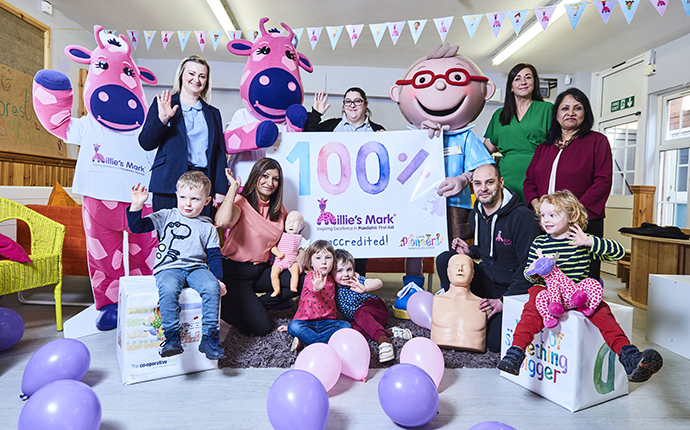 The mark certifies that all Co-op Childcare nursery practitioners are fully trained in paediatric first aid and confident enough to put their knowledge into practice should they need to. This goes beyond the Early Years Foundation Stage (EYFS) guidelines, which requires only one first aid trained practitioner to be on nursery premises at any given time. Representatives from Co-Op Childcare, Millie’s Trust, NDNA and Cllr Kate Booth, Cabinet Member for Children’s Wellbeing, celebrated this fantastic achievement yesterday (Thursday 7 February) at Little Pioneers St Edwards Nursery, Raddlebarn Road, Selly Park in Birmingham (pictured). Co-op Childcare has been involved with the scheme from the very beginning when it was first piloted at its nursery in Newburn in 2016. Its nursery in Dewsbury was then announced as the 300th UK nursery to achieve the accreditation in summer 2018. All Co-op Childcare settings now receiving Millie’s Mark rounds up a trio of milestones for the partnership. Millie’s Trust was set up by Joanne and Dan Thompson in 2012 after their nine-month-old daughter died following a choking incident at nursery. The organisation now campaigns to increase legal first aid qualification requirements amongst childcare providers. Millie’s Mark is delivered by Millie’s Trust in partnership with National Day Nurseries Association (NDNA). In order to receive the mark, nurseries must undergo a detailed audit and risk assessment process and indicate strong delivery of paediatric first aid training and understanding amongst colleagues through in-depth training courses. To achieve this, Co-op Childcare’s learning and development team rolled out an extensive paediatric first aid training course across its entire estate of nurseries. This on-going programme ensures the training of all Co-op Childcare practitioners and regular refresh sessions. To deliver this, the team first had to achieve accreditation to become certified paediatric first aid trainers and then visited all nurseries to conduct the two-day sessions. So far, 1,300 practitioners have benefited from the training, with more than 15,000 colleague hours committed to the project in total. Joanne Thompson of Millie’s Trust said: "It has been an absolute honour to watch Co-op Childcare, the first large childcare provider to achieve Millie's Mark across its nurseries, put such an emphasis within its settings on achieving this award in memory of our daughter. “Co-op Childcare is ensuring that all practitioners are not just trained in Paediatric First Aid, but that they are confident in using their skills. We would like to congratulate everyone involved in achieving this award and helping to continue Millie's legacy." Read more from Co-op Childcare in their blog and on daynurseries.co.uk.